At Arcane Artifacts we have one of Australias largest range of crystals and minerals on display. As we source, hand pick and purchase nearly all of our crystals ourselves we are able to bring quality specimens at reasonable prices to you. Sometimes it is hard to find exactly what you are looking for so if you let us know, we are sure we will be able to source it for you. 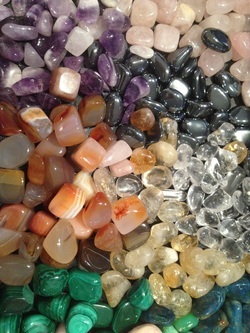 Our extensive range includes; Amethyst, Uruguay Amethyst, Rose Quartz, Clear Quartz, Rhodochrosite, Tiger eye, Kunzite, Hiddenite, Tourmaline - including pink, multicoloured, watermelon, green, blue, black and tourmalinated quartz, Tiffany Stone, Pietersite, Gaspeite, Fluorite - including rainbow fluorite and shu fa (calligraphy) stone, Lapis Lazuli, Morganite, Aquamarine, Smokey Quartz, Silent Grove Spectre quartz, Chrome Diopside, Chalcanthite, Moldavite, Malachite, Azurite, Atacamite, Sugilite, Pyrite, Realgar on Quartz, Cinnibar, rare Included quartz and many many many more... Too many to mention here! Our prices start at only $2.00, so there is something for everyone from young budding geologists through to the avid collector. So Do Yourself a Favour and come on down.